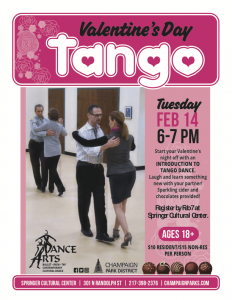 Start your Valentine’s night off with an INTRODUCTION TO TANGO DANCE. Laugh and learn something new with your partner! Sparkling cider and chocolates provided! Register by Feb 7 at Springer Cultural Center.